The latest issue of EW, hitting stands on Friday, September 25th, is a must have for all fans of THE OFFICE. The cover and story inside are all about the long-awaited, upcoming nuptials of Pam Beesly and Jim Halpert. 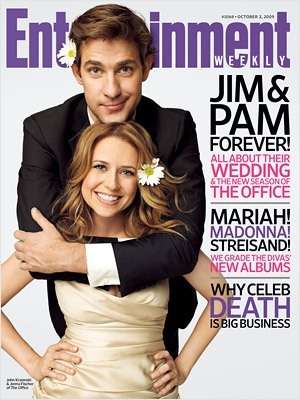 How stunning do John Krasinski and Jenna Fischer look on the cover?! Inside the magazine are juicy spoilers about the wedding episode which will air on October 8th. You can get most of the scoop right here if you are so inclined. There’s also a great behind-the-scenes video with John and Jenna at the photo shoot talking about how THE OFFICE will be transitioning into The Muppet Babies in an attempt to go head-to-head with Sesame Street. Maybe you should just watch it. Ah they are too cute! Thanks for posting this. :] Sadly I won’t be able to read it because I’m in Italy for the rest of the year. I’m definitely going to buy it but wait until after the wedding to read it. Trying to stay as spoiler free as possible and am doing really well so far. Could they BE any more adorable? I think not! I will buy it for sure…thanks for posting! They look adorable on the cover!